This review will be relatively short since most of the content of the DVD was already covered back in January in this event report. Sengoku Basara 4 Basara Matsuri 2014 ~Shinshun No Utage~ (hereafter Basara Matsuri) was a major event held back on Sunday 19th January 2014 at the Nippon Seinenkan Great Hall in Shinjuku, Tokyo. There were two different performances held on the same day: an afternoon show at 13:30 and an evening show at 18:30. Both were very similar aside from one change in the guest list. With a much smaller venue than other recent Basara Matsuri shows, tickets were extremely difficult to obtain this time around. Fans had to participate in a number of lottery drawings to stand a chance of earning the right to buy them, and even being in the official fan club was no guarantee of success. This DVD release was consequently the first chance to see the event for those unable to attend in person. I hope that future Basara Matsuri events will be able to accommodate more fans again as they did in previous years. 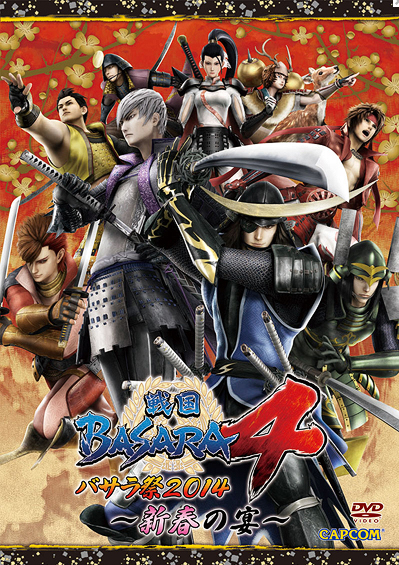 The DVD was given a limited release on 9th July 2014 at select retailers, namely e-Capcom, Otomart and the Basara Club. The standard retail release followed on 20th August 2014 and the set is now available from online stores such as Amazon Japan. It's priced at ¥5,000 before tax and includes a single DVD disc in a clear case along with a colour booklet. The booklet is quite nice, containing photographs of all of the guests (including a few studio pictures of KobaP). There were no secret guests this time - in fact, it was the opposite as Nakamura Yuuichi (Shima Sakon) was originally scheduled to appear but had to pull out at the last minute due to illness. Series producer Kobayashi 'KobaP' Hiroyuki was the only non-seiyuu guest (series producer Yamamoto Makoto was present too, but he looked after the gaming press instead of going on stage). Since my original event report already describes most of the content, I'm going to summarise the DVD more briefly than usual. The main feature contains just 110 minutes of footage from the evening show; everything else is part of the 90 minutes of extras. The DVD opened the same way that the actual show did, with a beautiful live shakuhachi performance of Tentei No Kigi from the game's soundtrack accompanied by a slide show of all of the Basara-zu ink paintings from the game. Seeing such a majestic song performed live is deeply emotional; I turned up the volume while watching the DVD and got goosebumps all over again. A full Sengoku Basara concert would be amazing, wouldn't it? Next came the fast-paced Sengoku Basara 4 opening movie. This led straight into the first set of live dialogues from the game's story mode: Matabee versus Masamune and Kojuurou (Oushuu: Aoba Castle), Katsuie versus Hideyoshi (Osaka: Toyotomi Hajou), Sakon versus Yukimura and Masamune (Shizugatake: Advance of the Oda Vanguard) and Sakon versus Mitsunari (Reflection - 'Shima Sakon': Time of Creation). As usual, lines from the characters whose actors weren't at the event were prerecorded. Even though I should be used to it by now, Matabee's angry shouts are really scary when you can see Miki performing them in person. Morita's spirited introductions followed. Ikeda was plainly the guest of honour since he was announced last and received the most applause, though Morita's stylish outfit was popular as well. The actors joked on stage for a while before KobaP joined them and the footage then cut the next event, the 'special talk corner'. The first half of this had KobaP and Morita chatting to Okamoto, Ikeda and Miki about all of the new characters in Sengoku Basara 4. Miki thought that Matabee was cute and Okamoto explained Katsuie's 'Kaiou' title to his fellow seiyuu. Ikeda was very sweet and humble as he described his impressions of Yoshiteru, winning the crowd over more and more with each shy smile. The rest of the seiyuu then returned to the stage for a quick talk about the returning characters to finish off the discussion. After the seimei handan fortune telling segment - which frequently descended into laughter as each character's results were revealed - came the team gameplay battle. This cut to the second batch of live dialogues: Keiji versus Yoshiteru (Remains of Ounin: Souden), Motochika versus Mitsunari and Sakon (Sekigahara: Western Shadow), then finally Masamune versus Katsuie (Shizugatake: Advance of the Oda Vanguard). It was then time for the farewell messages from the cast and the DVD's credits. The event felt much shorter without KobaP's news report and all of the videos! Still, the best part of this DVD was the bonus material with its footage of the seiyuu nervously fooling around backstage. Since there weren't many guests they seemed to stick together in a group more than usual, and even though the backstage footage is less than twenty minutes long it was full of interesting moments. One of my favourite parts was a behind-the-scenes look at Okamoto trying to show Hoshi how to play Sengoku Basara 4 during the gameplay challenge on stage. It wasn't obvious when watching the challenge live but Okamoto was constantly pointing at the screen and giving Hoshi tips on which buttons to press. Hoshi looked very anxious from behind but afterwards the two of them joked proudly about their performance. The other extra content was a selection of clips from the afternoon performance. It was much as I described it before, but I'll list the live dialogues just in case I ever need to look them up again in future: Sakon versus Masamune and Yukimura (Osaka: Toyotomi Hajou), and lastly Motochika versus Mitsunari and Yukimura (Sekigahara: Western Shadow). Because the afternoon performance was trimmed so that it only included new content, it was arranged very strangely. For example, the seiyuu introductions only featured Hoshi's arrival on stage before cutting to the next segment. As a result of this aggressive editing, I don't think it would make any sense to watch the afternoon performance before the evening performance unless you're a huge fan of Hoshi and want to see a version of the event where he seemed much more prominent than he was during the original show. Overall, this was a fun DVD. The quality of the video and audio was pretty good; the faces of the audience members were deliberately blurred out but everything else was nice and clear. If you were only buying one event DVD, I'd probably recommend choosing one of the larger events for the wider selection of guests, but this is a pretty good option and (so far) the only way to see Miki Shinichirou participating in a Sengoku Basara event. On the new seiyuu, Okamoto really is a sweetie, I'm so glad that he's joined the cast of the series. Ikeda is a lovely guy and he seems genuinely eager to support the series, and Miki is terrifically intimidating (in a good way). They've all made a strong impression on me. It's a big shame that Nakamura couldn't make it since there haven't been any big events since; somehow it feels as though he's yet to debut even though Sakon is a familiar sight by this time.